In the last few years I have really wanted to travel more. But due to lack of time or money this was more of a pipe dream. However, in the past 11 months I made it a priority to see more of the world, starting with Europe! My boyfriend and I most recently went to Budapest together this June. Budapest has some of the most amazing bars, great restaurants and breathtaking views. And the best thing is, you don’t need much spending money as everything is SUPER cheap! 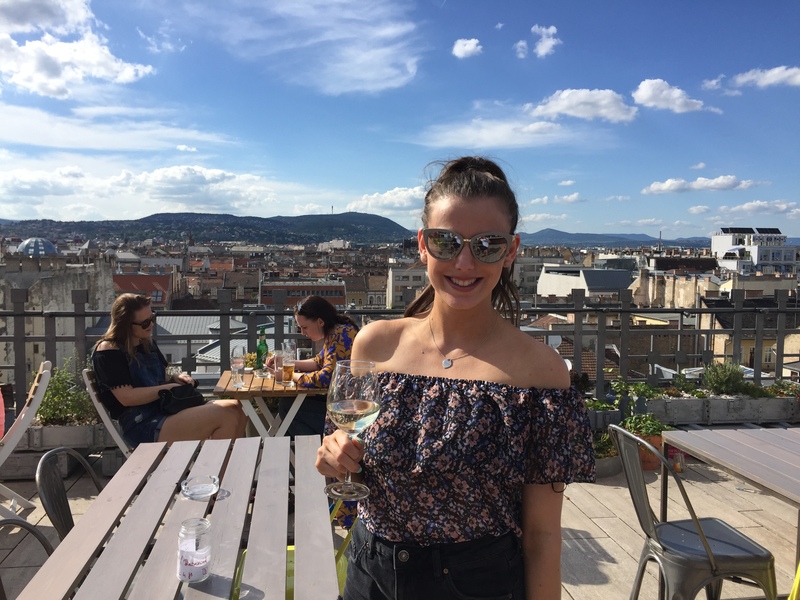 Here is my lowdown on my top places to eat and drink in the Hungarian city! 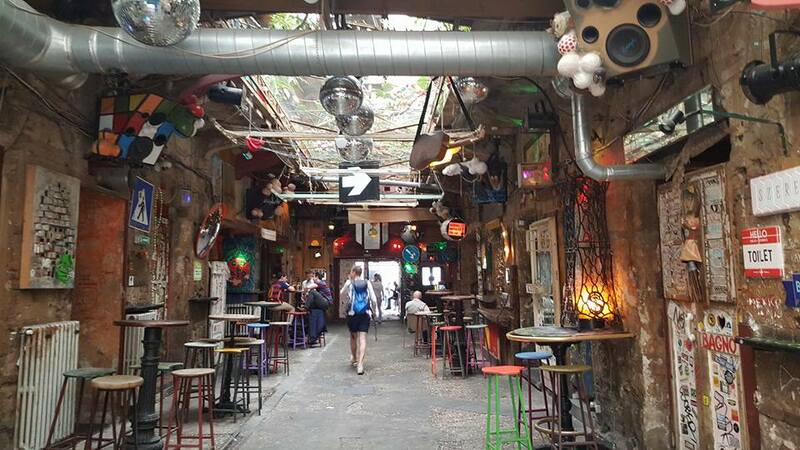 If you have done any research on bars in Budapest you would have undoubtedly found Szimpla Kert! 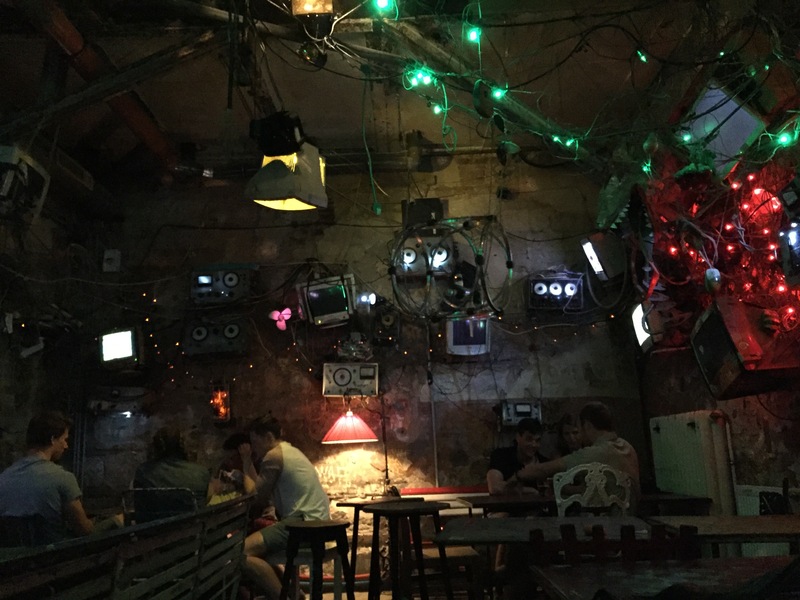 It is rated as the number one bar/club in Budapest and it is clear to see why! 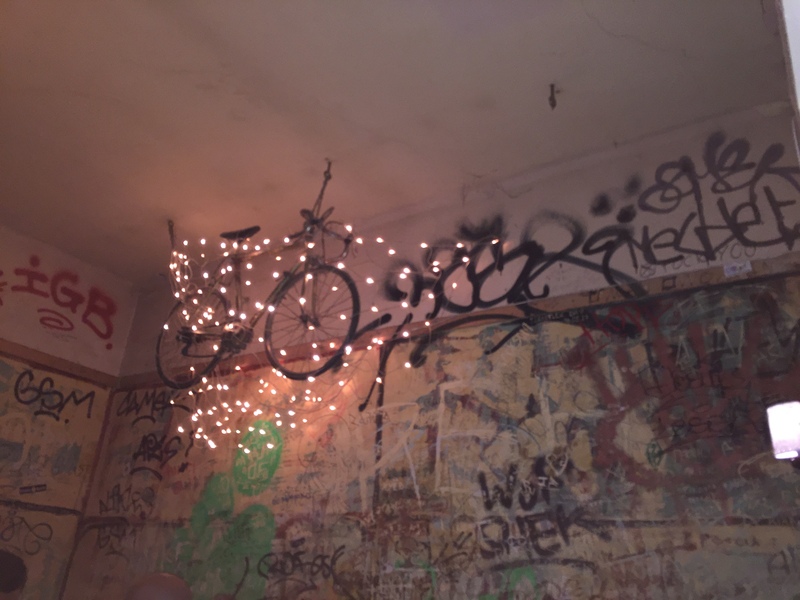 It spreads over two floors of ruins with nearly ever inch of every wall covered in graffiti. 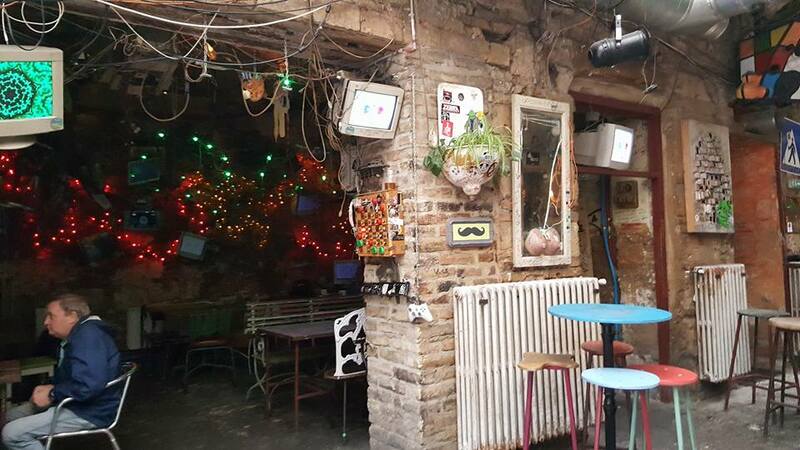 It has a courtyard area which includes a porjector ‘cinema’ screen, many themed rooms full of quirky objects, several bars, places to order food and a performance stage. This bar is like no other! From a room filled with retro computers and game consoles to the room with a bath and a huge toy dog in it. Not to mention the unusual furniture including old fashioned cinema seats and sports apparatus; it really is an experience! Now forget ‘shot girls’, at Szimpla Kert, the is a woman walking around selling carrots which she advertised as a “healthy snack” at 2am! The food is highly rated although we only drank here. I recommend the Palinka, but only if you have a strong stomach and are willing to try a Hungarian shot… DISCLAIMER this drink is not for the faint hearted! Open 12 noon- 4am Monday-Thursday & Saturday, 10am-4am Friday, 9am- 5am Sunday. Free entry. Drinks prices ranging from £1 for a draft beer to £1.70 for a glass of wine… amazing right?! After a day of a sightseeing, this rooftop bar was the perfect setting for us. With panoramic views and live music starting early evening it is both spectacular and peaceful at the same time! We were lucky enough to get a table straight away although it is advised you book in advance, particularly for the evening. This is probably one of my all time favourite bars! It is super chic, has breathtaking views and an amazing atmosphere, what more could you want?! Open 2pm-12am Mon-Thurs, 12-2am Fri- Sat, 12pm- 12am Sunday. Free entry apart from after 8pm Fri-Sat which is 1000 HUF (which works out as less than £3). 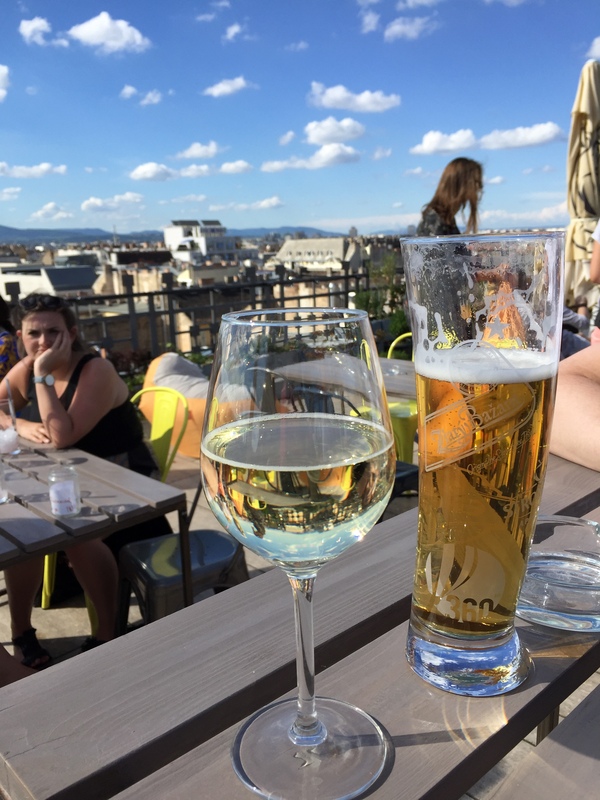 Drinks are classed “pricey” for Budapest but I’m pretty sure my glass of wine cost around £2… so not exactly a London price tag! 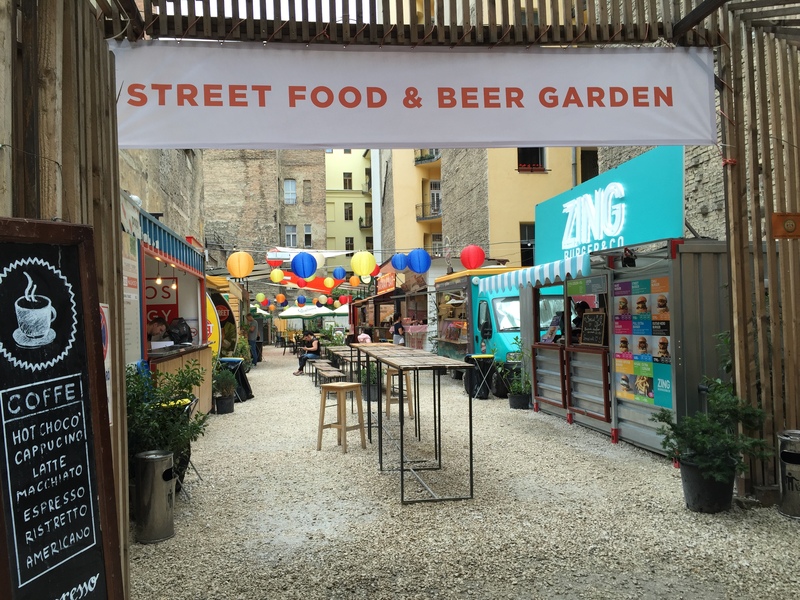 We stumbled across this cute little selections of food stands and pop ups the day we arrived in Budapest. It had everything for traditional Hungarian cuisine to Italian to Mexican! We ended up not eating here until our last day and I am SO glad we did! 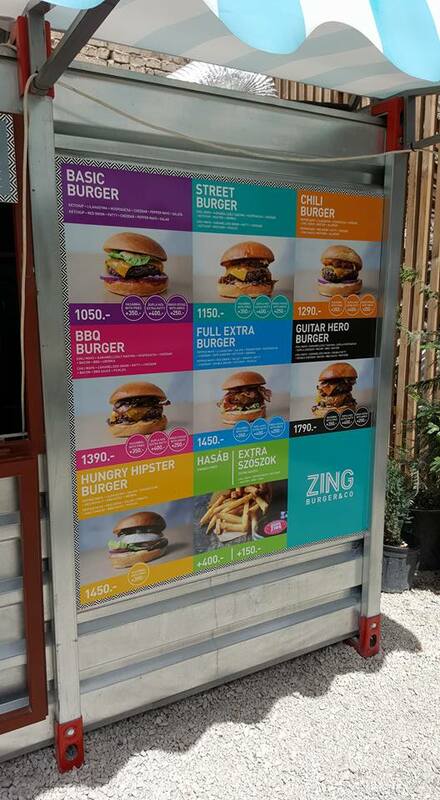 First we got a burger from ZING. We both had the basic burger which had a delicious beef burger, lots of cheese, relish, onions and salad. Accompanied with chips and a homemade lemonade it went down a treat! Afterwards we spotted pops a frozen fruit ice lolly stall and I chose Mango (my fav) and it was so good and so refreshing! Open 11.30am-12am Sunday- Wednesday & until 2am Thursday- Saturday. 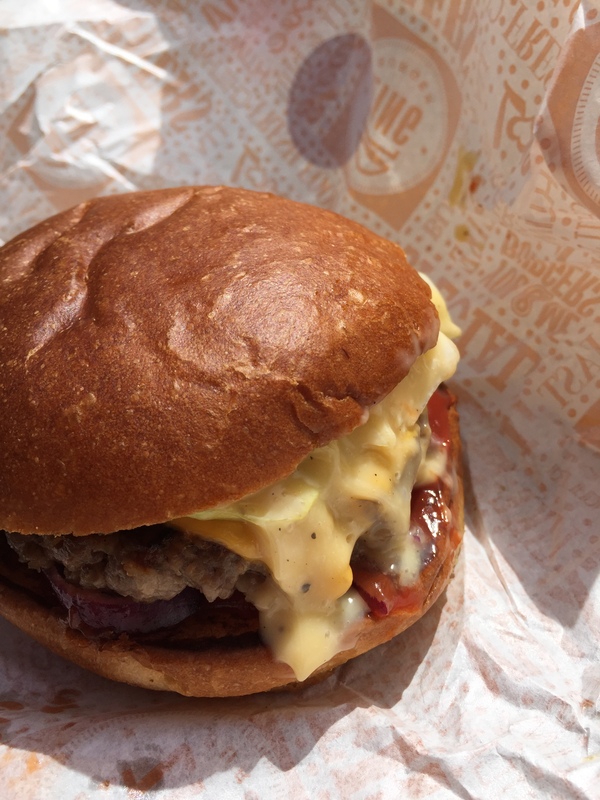 Burgers from £2.70, other food and drink prices vary. The ice-cream is delicious (and I’m a bit of an expert being Italian) AND they make it into cute flowers! Its located near the Basilica so is super easy to find. What more could you want?! Depending on the number of flavours you choose, they are between £1.40-£2. It is a bit of a trek to find this gem from the city centre, but if you don’t mind a walk I would definitely go and check it out. Hidden in a more residential area of Budapest, it’s in a small, cosy room surrounded with books with a reading light on each table. 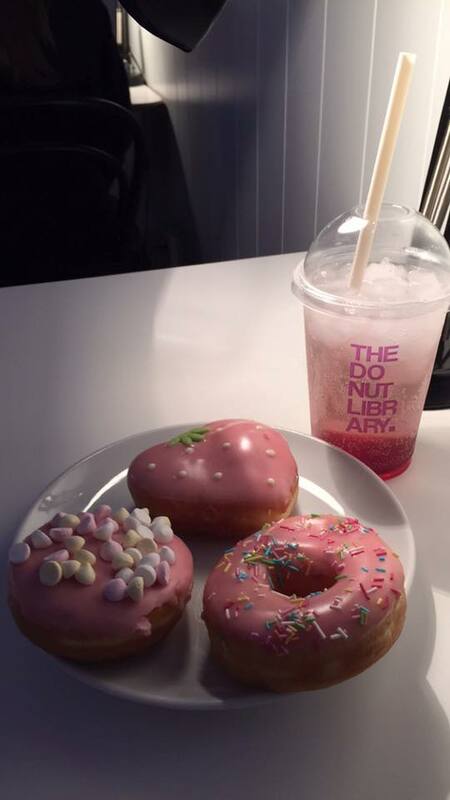 We shared three doughnuts; a pink ring with strawberry frosting and sprinkles, a strawberry flavoured filling doughnut and a banana filled doughnut with mini meringues on top. YUM! They also have a big selection of hot and cold drinks. 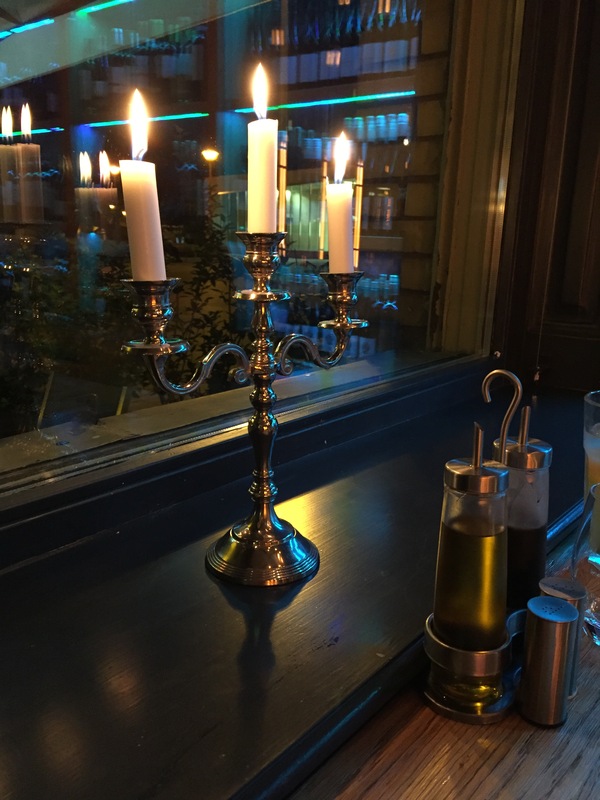 This Italian restaurant has a very romantic setting, complete with candelabras! I went for the wild boar ragu which was served with tagliatelle. The presentation was beautiful and it tasted even better! The freshly made pasta was al dente (the Italian in me was VERY happy) and the ragu melted in my mouth! The staff were very attentive and friendly making it a very enjoyable experience! Open 11am to 12am Sunday- Thursday & until 1am Friday & Saturday. My main cost around £8 and a cocktail costs around £3.50 (I weirdly couldn’t find their wine list online, despite being a wine bar!). The outside of this restaurant is unassuming but it looked pretty busy every time we passed (which is always a good sign!). The interior of the restaurant is gorgeous. It has stone walls, high ceilings and little alcoves. 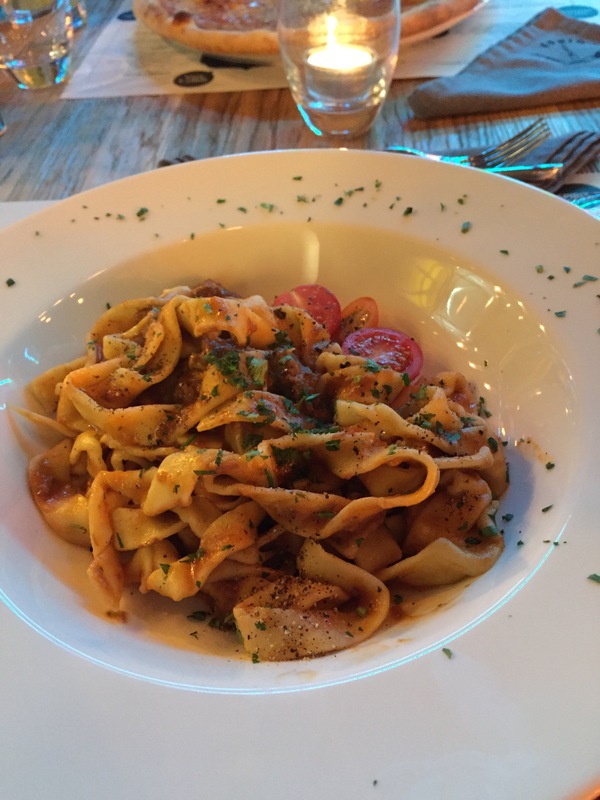 It is an authentic Italian restaurant with Italian chefs so we knew it was going to be good. But we didn’t know just how good this pizza was going to be! This is probably one of the best pizza’s I’ve ever had (outside of Italy of course). The base was think and crispy (and huge!) made with all free ingredients. I would DEFINITELY advise getting the pizza if you come here! Open 7 days a week, 11.30am-11.30pm. Pizza’s from just £3(!) and a bottle of wine from £10. Next Post What’s in my hand luggage?